My dear 1st year students! I would like to offer you several references that can be helpful tools in your learning Reported Speech in English. Following the steps already taken at our lessons, I would advise you to start from the revision of such verbs as “say” and “tell”. Used in various collocations they also serve as the most common introductory verbs. Learn more about how to use them and practise them together with Jase in his Collo Tune. Watch the tutorial by Seonaid who gives a very thorough analysis on how to put statements into reported speech. This will help you revise the theoretical material in detail. Then, listen to a song accompanied slide show from Teacher Frank. I am sure you will enjoy it: nice pictures and music make learning much more pleasant and effective. You can download the transcript and study it beforehand, but the other way is … just listen and watch. If you find it a bit difficult to follow, listen to it several times. During your 1st listening read the text at the top of each slide, during your next listening – look at the centre of each slide, and finally (3d listening) – the bottom of the slides. Enjoy yourselves! And have a good weekend! Well, it was great! I really liked that! Video with Jase was excellent! This guy knows how to deal with audience. And you know what? From this moment I start to call collocations – collos! As for the second video, it was a bit boring. But maybe it’s because this video is usefull. And the last. Well, the song was the most interesting for me. Then, it was information on the bottom of the slides. I know that I had to put more attention to reported speech, but I couldn’t help it. So, the second video was for learning, while others were for entertainment. Thank you for summarizing your experience of learning reported speech! I really liked your words about usefull videos! There is always a kind of a bitter tablet whose effect is quite strong! Thank`s for these really usefull links!!! I like watching such video lessons from time to time. Some of them are interesting, some are not. Anyway I guess the first one was the best of them! Jase does everything with positive emotions and gives information in a very lively way. Very nice lesson!!! Thank you for these links. I think, Reported Speech is quite difficult grammar material and it’s not so easy to understand it without learning extra information. I like the tutorial by Seonaid. It ‘s extremely helpful for revising the material . Also I like the song “Love Potion Number Nine”. This is a good visual example of using Reported Speech and also it’s funny. I was really astonished to see such huge variety of educated videos on YouTube and their viewings in such quantity! So many people desired to know English better! It’s just amazing! And that is the exact truth that the best way to learn to use “say” and “tell” is the three Rs: Relax, Repeat and Remember! The first video is great!!! There is much useful information. Jase gives useful information too. I think this is the best way to learn to use say and tell. As for the third video I did not like it. The song in this video is very boring. so watching it I started to fall asleep. The first video was best of the best! I enjoyed it very much! Great teacher! I liked the way he explained the material. Also I really liked doing the exercises he offered. Everything became clearer and, of course, was useful. In my opinion,Jase is great as a teacher!It was rather tempting to watch his method of explaining the material about Reported speech .Also i like collocations,which he calls collos! For me it is important to have practice.And the 2nd video gave an opportunity to learn fast. I really enjoy the last video ,it is always more interesting to revise the material in such a way,when you listen the music ,see nice pictures and have practice! It was quite interesting, but the first video really surprised me. I’m not a big fan of rap that’s why it was a bit difficult for me to listen to the teacher reading the rules in rap style. The second video was quite informative, but rather boring. Anyway, I enjoyed all the videos and tried to take as much as I can from them. Thank you! In my opinion,Jase is great as a teacher. The second video was quite informative. But most of all video number one. They all have a lot of information. I’ll try to remember everything. I really liked that! I enjoyed the first video most of all! Of course all of them were very very useful and interesting. From my point of view, the videos are informative and helpful. It’s worth mentioning that the material is presented through entertainment, so it makes it easier to heap up everything in memory. As for the second video, it gave the opportunity to check my knowledge and go over details of tense usage in the reported speech. Thank you! It is very useful information. I liked the song and the exercises the best cause they were very useful for me. I liked first video most of all.This man is very interesting and he gives us rather useful and helpful information. As for the Seonaid`s video, it was great to check my knowledge. I`ve understood using tences in reported speech better. Well, all videos were great. Tutorial by Seonaid helped me to repeat all the rules. I think that practice is power )) As for the first video- it was rather unusual.But I agree with Irina. I’m not a big fan of rap neither, so it was a bit difficult for me to listen to the teacher reading the rules in rap style. Sorry for repeating. I also enjoyed the third video with a song “Love Potion Number Nine”. Some videos were really good. The lesson by Seonaid and teacher Frank really helped me to practise english. I repete these lessons several times to make practise more effective. I was delighted with the first video, I even watched it twice, I really began to understand the difference between “tell ” and “say “. The second video was also very interesting for me I’ve done everything correctly, i think this is the reason why i liked it so much)))) and I really liked the song in the third video. Thank you very much!!! The second video is very easy! but useful. But i don t understand why they wrote ‘the next day or TOMORROW? Well done, Tamara! I mean the thing you noticed …in the English textbooks is usually viewed the following way: ‘tomorrow’ is a norm in the direct speech, and ‘the next day’ or ‘the day after’ is a norm for the reported speech. In my opinion the first video was ok, but it was hard for me to understand what the man sang and words on display helped me. The second video was so simple but, I must say, very useful. And last video was the worst for me, I tried both to read and listen the song so I didn’t like it. But thank you! Thank you for all the videos! They are always very interesting and useful.They were clear for me. I refreshed my knowledges about Reported Speech. I want to say something about the first video: it’s very funny to study when the lesson is a song! I sincerely liked it. And it is very useful to know the difference between the two verbs. The tutorial by Seonaid was very interesting too.The exercise was very helpful and now i it’s easier for me to change the tense of the verb in the reported speech. I also enjoyed the tird video” The slide show”!! The videos were very useful and cool. Most of all Iiked the “Collo Tune” video. The impression is,that such way of teaching helps to understand and memorise the rules better. Thank you for all the videos!! All of them are rather interesting! In my opinion the first one was the best. I liked the first video, it’s very amusing. But I think the second is most useful.This videos help me to refresh my knowledge.Thanks. Thank you very much. I liked all videos. The Collo Tune video is really funny, I think Jase needs Grammy for his grammar rap-songs, that’s really cool, helpful, and I like his students. Also I enjoyed the test. At the beginning I made a lot of mistakes, but in the end I answered automatically . And I’ll see Love Potion №9 in my dreams!!! Oh, video number one is great!! It would be more interesting, if all videos were like this one! The second video was useful, but a bit boring. Well, I was impressed by the first video. This Collo Tune is so inventive and smart, and also cute! ^_^ I would have never guessed to make such a song and such a method of teaching! It’s really useful. And entertaining, of course! The second link with exercises is important to consolidate material. I like it, it was useful for me. As for the third link… well, I don’t like it, because it wasn’t clear for me and it was not so entertaining and helpful as the two above. All the videos were very interesting. But I like the first one the most because Jase’s manner of presentation is quite unusual but very useful. Thank you for these links. oh The video by Seonaid is very useful.I practice more effectively, and revise all the rules. Wow! I like, like, like it!! How it’s interesting and exciting to learn English Grammar and Language in such way as a listening to songs. Sometimes you want to stop the video and watch something more interesting. But these videos aren’t boring. I liked the song where mentioned Love Potion Number Nine. I watched this film when I was a child). Besides the material is learned so easily. Thanks a lot for the great videos. You always do everything to interest us. Thank you for these links very much! The exercises in the next video were quite easy so it took no efforts to do them. As for the last one, at first it was a bit difficult to follow, but after listening to it one more time, everithing was clear. I really enjoyed the material. The videos are great as usual. I like the first video the most. I like his way of explanation. It is clear and easy to understand. Especially the song. Thanks a lot. the material which you offer a very interesting and it helps in the entertainment form internalize the topic… I particularly liked the training rap about Reported Speech, and the test was quite useful..
Well, videos were really great, but I don’t like the last one. I’d like to say that video by Seonaid was very useful and while the video was playing I remembered all the rules. It was the best training for me. i liked all videos. but i thin the most useful one is the second video/ from my point of view, it will be great if we use more videos like this one. I saw all the videos. They were useful and interesting. I revise all the rules. Oh, all the videos were great! I don’t like the third video. I can’t understand all this information that come every few seconds. But another movies seem to be useful, especially the first video. And although the test is quite easy, it is very useful to pass it before the module test. Collo Tune is a pure talent! And the song about Love Portion is instructive. Really nice videos. To my mind, such sing lessons are better than classical ones because they are much more interesting. One can remember the material better because it is presented in an unusual way. Songs from Jase in his Collo Tune and from Teacher Frank are practical, because when you hear the material given with the melody or at least have rythm it helps to catch on quickly and without any problems. The video with practical exersises helped to check my grammar. The videos are great)) I refreshed my knowledges and practised with the exercises)) And it was interesting to listen to the song. “Collo Tune” was fine. I love to sing, to be honest. I liked how he explained! It was funny and understandable. The only disadvantage – the words a little bit late. The second video was a little irritating because of the rapidly changing colors, but useful. The third video was especially cool! I loved it! Just a bit the words in a hurry. I was really astonished to see such huge variety of educating videos on YouTube and their viewings in such quantity! So many people desire to know English better! It’s just amazing! And that is the truth that the best way to learn to use “say” and “tell” is the three Rs: Relax, Repeat and Remember! Very good. The video from Teacher Frank helped me to practice my English. I would like to say that the first video is excellent and i really like it most of all.My friend envied my way of studying English and was surprised of using rap in video.But I was not so interested in the second video. I think it was a bit boring – there wasn’t any animation or music. But I suppose that the video is useful for me. I liked all the videos but my favourite is the first one. Its because of the modern approach to the learning of a foreign language. I mean the rap-style which is used in it. It attracts the youth because rap is popular with the young people. The video is very funny and amusing! I really liked the video of indirect speech, I did not expect that it would be interesting to listen to his teacher devised a song about it. Very interesting. I think that it was difficult to pick up and composes words and rhymes. Generally great video. Oh, it was great! Before watching it, I had a lot of problems with Reported Speech! But now, I understand everything! I was impressed by this video! tHANK YOU! Most of all I liked the first video! I was surprised that the difference between `say` and `tell` had been explained as a song! I wrote down some phrases and laught at his explanations. I had some difficulties with reported speech, but while I was watching the second video, I trained a bit. To say the truth, I didn`t really liked the third video, because I had to stop mostly after each slide to read everything, but, I think that this video is useful too! Thank You! i’m very grateful for all the posted videos . some of them are very useful and clear, but not all of them are very interesting as for me. I enjoyed these videos. it must be admitted that they all have a lot of information and I tried to remember everything. I liked the man who was singing a funny song and I think it is very useful way to learn the difference between “to tell” and “to say”.The second video helped me to check myself. And as for the last video it also was interesting and effective. Thanks for these videos. Most of all I liked the first two videos. Especially this exciting song about “tell” and “say”. The second video helped me to repeat the studied material. Such information helps me to learn it better. The second video is valuable and helpful exactly for students, who want to practice more. That’s great! The last song is amusing. But I needed one more review to stop the video in each part of the song to read useful comments and tasks. Well, these videos were pretty… Unusual, to say the least. Well, Jase… That guy’s got SWAG. I’m not really fond of rap, though. The second video was plain, nothing special. The third video has a nice tune, sounds like something from the 90s, liked that one a lot. All in all, these videos were pretty decent, a nice touch on education. Thank you for such videlos. I liked English ESL Say and Tell Verb Grammar. This video was interesting and useful for me. It was advisable to learn the difference between Say and Tell. Sometimes we don’t recognize how to use correctly some words in different situations. Exercises in the 2 video was good. It’s really good practice for students. As for the song, it was nice. But i Liked 1 and 2 videos best of all. As always you picked great videos. At first I was not enthusiastic when he heard rap again, but then, unexpectedly, I remembered almost all phrases. The video Seonaid was a little boring for me, but the last video pleased me. From my point of view some videos were really good. But as I mentioned earlier i don’t like RAP lessons at all! I can’t concentrate on my grammar.However, if we don’t focus on grammar it is all a waste of time. So,Reported Speech is quite difficult grammar material and it’s not so easy to understand it without learning precise rules and information. As for the song “Love Potion Number Nine” i like it.. This is a good visual example of using Reported Speech and also it’s nice and funny. Oh.such interesting way to remember the rules of using say and tell in the reported speech,but i think it’s not my style.I don’t like rap.The second video is also very usefull and it’s more convience to learn and remember.The third video with song,including reported speech is funny)))Thanks. The videos are very great as usual. I enjoyed the firs video. I like this song. It is very amusement and the rule helped me finally to understand the difference between “say” and “told”. The others videos are also very good and helpful. I really enjoyed the first video. This man is amazing. I think this is the right way to get people interested in the study and show how to use the words «say» and «tell». The second video helps to check what I heard from the previous video. The third video was very boring, but I liked the song. Thank you very much for posting such useful video! They are always so helping and instructive! I enjoued both videos and a song a lot and now my knowledges of reported speech is much better than before. Thank you for this one more time! I disliked at all. It`s rather boring. In conclusion I`d like to say that all this videos are useful! As for me, the videos are informative and helpful. It was great, I really liked that! Video with Jase is the best! I really liked that guy! He knows how to deal with the audience. As for the second video, it gave the opportunity to check and refresh my knowledge in reported speech. The second video is also very informative. And I liked it too! Thanks for this video lessons ! And a third video is also good! informative! I liked it all! Thanks for this too ! All are clearly explained ! I liked the funniest one, Colo Tune. The second and the third video is boring and flat. Easier to remember and assimilate the information, if it is an interesting and extraordinary video, such as Colo Tune’s video. I saw his video about Irregular Verbs before. I was surprised and remember it so far. As for me,all these videos are useful for us, for students. I was able to recall and repeat the rules for the construction of indirect speech and the difference between verbs ”say” and ”tell”. The first video was the most interesting for me.I liked the method of presentation of that man, I wanted to listen to him more and more. It was a bit unusual lesson. The next two videos seemed to me a little bit boring, but useful enough…while watching the second video, I had the opportunity to test my knowledge.Thank you!! All of the three videos are very instructive. But most of all I liked the first and second videos. It was very interesting watch this material. I looked all three videos and I would like to tell my opinion about each of them. All of them have their pluses and minuses. However, they are very easy to perceive because of their interactivity. Looking at the screen we automatically start to memorize the rules. Thanks to the sound we also activate an auditory memory. But as for me, Fluency MC provides the information in an easier way. Maybe, because I like when people sing. I also drew attention to «English Grammar – Reported Speech», because they are also used the music, but the sound was too fast. This made difficulties. Well, the first video made unusually. But it was pleasent to me, especially music with which everything is remembered easier. As for the second video, I remained in admiration. If I was the person who studies English not so long time ago or just wants to improve the knowledge, I would study on the video lesson, for example like this video. Thank you for these great videos, especially I liked the last one. All information in musical interpretation and it`s very help me. The second video explains a subject in details, it`s very helpful. But first video very fast, therefore at the beginning it is very difficult perceived. Kate Mutovkina. I think that the first video “Collo Tune” so funny, but very useful to us. Because many people are confused in this subject and this guy on the video well explains. On the second video “Seonaid” there are a lot of examples and I like that a have time to think about correct answer. On the third video “Teacher Frank” I liked the song and an explanation of each line. Thanks for useful information. I liked the funniest one, Collo Tune. The second and the third video is boring and flat. Easier to remember and assimilate the information, if it is an interesting and extraordinary video, such as Collo Tune’s video. I saw his video about Irregular Verbs before. I was surprised and remember it so far. Generally I agree with previous comments! For many the most interesting was the first video and for me too! After watching the first video I was in delighted!!! I liked Grammar Rap and Jase) I’ve understood the difference between “say” and “tell”: Say something to someone and Tell someone something! Before watching this video I’ve done a lot of mistakes but now I hope I’ve understood this difference forever! The second video wasn’t so interesting but was useful for me! I was able to focus on grammar rules without pictures and music! But the third video wasn’t interesting for me at all! Those examples with the Gypsy were difficult to understand. I found out that the first video was the most useful and interesting for me. At first Collo’s “song” irritated me, because I could hardly hear actually when words “say/tell” are using. Thanks for the subtitles! It helped a lot! Mostly I enjoyed the second part of the video, when he started to explain the information. It was clear and hopefully, I won’t switch these two words in the future. I’d like to have a teacher like him, because he is so hilarious! The second video was also very useful! I could check my knowledge and also it helped me to understand where I make mistakes. Before watching this video I mixed up the tenses. So, I hope that I will learn from my mistakes and I won’t make them anymore! The third video I really enjoyed! I really liked that song! Besides, it was very useful too! All these videos are great! One more useful than others! Ofcourse singing lessons is interesting and creative, but when I heard a rap style lesson, I thought that I could not understand what they want to explain me, but after watching this video till the end, I get it. The most important and main thing it is understand the rules, I think. The second video was very useful too! This video helps me check my knowledge more than other video.It is simple and not boring if you are not distracted ofcourse.Also I liked third video where played a nice song.Watching this video we may enjoy the music that is not a burden, and at the same time check your knowledge an learn something new. Thank you for all these videos! Very well thought out!) All of them are very helpful and not boring! Generally I agree with previous comments , but I also have my point of view. The difference of words “say” and “tell” became more clearly after viewing these three videos. The first video was not bad , funny and what most importantly – understandable .I hope that I`ll not confuse these two words anymore . I think that it is useful to know . In verses memorized easier , I suppose . The second video as well informative and useful as the previous . I answered on oral questions correctly , because then convinced of the correctness of my answers . The third video was more musical and not bad for me too. Everything was clear and understandable . And if I suddenly forget something, I`ll immediately take a look the videos again . I agree with those who believe that all the videos are good and useful. I think that the first video is very interesting. Watching it,I understood the difference between “tell” and “say”. The song in this video is very funny and useful. When the man was singing this song, he was very funny.Man explains the use of verbs very well .In my opinion, people who watched the video, do not have a problem with using these verbs. The second video I liked the most because I could test my knowledge. Girl’ pronunciation is clear and understandable. After watching this video I became more experienced. The third video I did not like. Of course the song was good, even interesting. But slides are very fast. I do not have time to read the information. I think anyone not like this video. Thank you very much for such an interesting and informative videos. I will be glad to see the next videos. I totally agree with previous comments. The first video is the best and the most interesting for me. I like this man and his song! I have already watched the video with him, it was about irregular verbs and it was amazing! Also I understoond the difference between “say” and “tell” and now it´s clear for me. The second video helped me to understand grammatical nuanses of reported speech, it was very useful, but less interesting than first video. I liked the lovely song in the third video, but it was too fast. So thank you for this useful matirial. Now I understand this theme is better. All the previous are right!! I absolutely agree with their opinion)) The information is useful and clear as usual.They are really good. I was able to recall and repeat the rules for the construction of indirect speech and the difference between verbs ”say” and ”tell”. But I did not like rap at all because I am not fond of such music. Yes he is good in dealing with people but his singing is terrible. Another two videos are helpful enough. The exercises are interesting as same as pronunciation, so I liked them very much. oo I am sorry, i missed the word ‘students’ after word ‘previous’ in the firs sentence. I watched all 3 video. The first I like the most. This video was the clearest. It helps me to know a difference between tell and say. The teacher sang fun song, where the using of these words was comprehensible. If somebody looks this video, he will understand rule. But I can’t say the same about 2 and 3 video. Well, second video you can understand, if you know something about reported speech or if you know it generally. But if you don’t know anything you will not understand the using of this rule. And of course it is boring. I think that explanation, which students can look in the different video or pictures have to be interesting and clever. All have to be transparent. Nothing hard and difficult. And the third video was terrible. A song annoyed me, pictures moved so quickly. All words mixed. The background is very bright .It is hard to catch the most important. Thank you for 3 videos. I prefer the first one. I agree with previous student.This topic is really useful. The first video was interesting. This is a good idea to tell us new information in rap song. I was attentive, because man shows difference between two verbs. The next video was informative for students. Many examples help to check our knowledge. I saw my mistakes. And then I understood how I have to fixed it. In the third video,I heard amazing song. I relaxed and at the same time I studied. It was very interesting for me. 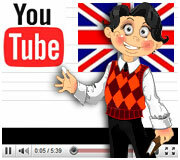 All this video give me an opportunity to see how it important for learning English. Thank you for these wonderful videos! I enjoyed the first video most of all. This man is very interesting and he gives us rather useful and helpful information. The second video was very simple and useful, so it was helpful for me. Also I like at last video, all video clips weren`t boring, so I had very good impression about all sources of information. The second video was useful and very simple. In the last video I like only the song/ The video was very boring. I found them to be both interesting and useful. Frankly, I was really glad to watch an English teacher singing his rap songs again. I think he is a great composer as well. In my opinion, Jase clarified such a tricky grammar structure easily and intelligibly. The second video by Seonaid helps not only with grammar but pronunciation as well. So, it`s a kind of a double practice in one video:) And I liked the third video very much, although I have never listened to this song before. These slides from Teacher Frank were very helpful. Thank you for this wonderful and inspiring post! I like teacher’s rap a lot, very unusual way to explain. And I think very memorable. I have refreshed some collocations with “say” and “tell” while watching it. The next video was very useful because we have opportunity not only to listen but to have some practice. I have never listened this song before but I like it) I think songs also can help to improve grammar skills. So thank you very much for videos that are doing the study process more interesting. To my mind, the most useful video about the reported speech is the last one – with the song Love Potion Number 9. I think it is good that video includes references with explanation of some phrases that are important for understanding of the song’s sense. In the second video one has a chance to practice making reported sentences from direct ones. The exercise has sentences with different tenses; therefore it is necessary to remember to change them in the reported speech. And Jase is his usual self. He sang a song and explained some grammatical differences between ‘tell’ and ‘say’, but actually he spoke more about the examples of collocations with these verbs. I remember this guy, he very funny. Firstly when I saw the topic I smiled and remembered how his songs interesting and fun. He knows how to cope with audience. But I was not so interested in the second video. I think it was a bit boring – there wasn’t any animation or music. But I am sure it was very useful. The first video was great. The theme was presented in an usual way. The teacher could explain the difference between ‘say’ and ‘tell’ quite well. Doing the exercises I had some more practice on this topic. I enjoyed listening to the song because it was interesting. Moreover, the explanations on the grammar and meaning of some new words were helpful for me. I found these videos very useful. Thank you. Thanks for the opportunity to watch such interesting and useful videos! I have already seen a video in which Jase was singing about irregular verbs in the same format. It seems to me that to study a material with the help of these videos is a good way to have fun and learn the rules at the same time. The other two videos were interesting too! They gave me the chance to practise and check the knowledge. Thanks! The second video is again from my favorite girl with nice voice. I so like it! And, of course, as a small tradition – a cool song. It was interesting and good, but it was a little uncomfortable to stop the video and song to read the text. Again, this strange man who loves to rap! On the one hand, he explains his lesson well, but on the other hand I do not like rap. A little bored for me. Of the three videos I liked video fron the “Perfect English Grammar” channel. I added this video “favorite videos” because I want to I want to turn and look again if I forget something. Once again thank you for the interesting video! Oh my God! The first video is gorgeous. I wanted to sing with these men.And I done it! He’s very charismatic. And good teacher . Such nformation perceives much easier and clearer. The second video is also very useful, because we can see all graphically. The third video is also very useful and pleasant for perception Thank you very much! I really liked these videos. Thank you very much for this post. All videos were useful and helpful. I really enjoyed watching all of them. Such information perceives much easier and clearer. This videos gave me the opportunity to practise and check my knowledge. Well, videos were really nice! I really enjoyed the videos in this post. This makes them particularly unusual and adds a desire to watch its again and again! Thank you for posting the videos which made the rules clearer!